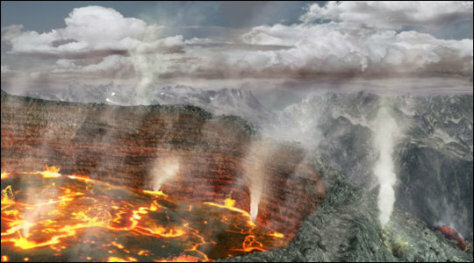 An illustration of a large-scale volcanic eruption. In a recent paper, scientists argue that there are two types of events that can cause extinctions — "pulses" such as asteroid impacts and "presses" such as million-year-long eruptions. The chances of a mass extinction event go way up when both happen together, they said.